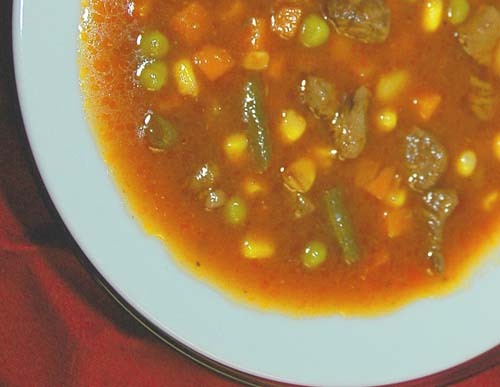 Here's a simple, yet satisfying recipe for vegetable beef stew made in a slow cooker. It can be cooked in a pot over a stove as well, but using a slow cooker makes it less of a hassle. It takes about 8 hours to make, so you'll have to plan your morning to have it ready for supper. Brown meat with onion; drain off fat. Stir in remaining ingredients and add 1 or 2 cups water. Cover and cook on low for 8-10 hours. Sometimes I add potatoes, cut celery, chopped cauliflower and whatever else in the fridge that suits me at the time. And that's the fun thing about beef soup, it's compatible with a lot of ingredients. Also, if I have time, I make a side salad to serve with the soup and it makes the meal that much tastier and healthier.